British Foreign Secretary Boris Johnson will fly to Washington to urge Donald Trump not to scrap Iran nuclear deal. British Foreign Secretary Boris Johnson will fly to Washington on Sunday where he will urge U.S. President Donald Trump not to scrap the nuclear deal with Iran, the BBC reports. Johnson will stay in Washington for two days of talks with senior White House figures, according to the report. While in Washington, Johnson will meet U.S. Vice President Mike Pence, National Security Adviser John Bolton and foreign policy leaders in Congress, according to the BBC. 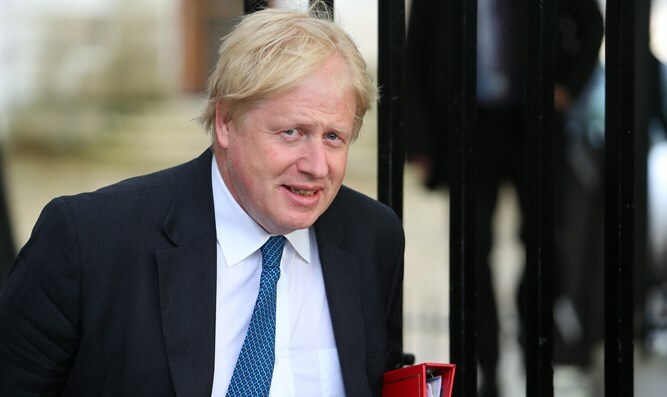 Ahead of the trip, Johnson said Britain and the U.S. are "in lockstep" on many global foreign policy issues, citing the response to the use of chemical weapons in Syria and the Salisbury poisonings. "The UK, U.S. and European partners are also united in our effort to tackle the kind of Iranian behavior that makes the Middle East region less secure - its cyber activities, its support for groups like Hezbollah, and its dangerous missile program, which is arming Houthi militias in Yemen," he added. The meeting between Johnson and Trump comes several days after Prime Minister Binyamin Netanyahu revealed information gathered from Iran’s nuclear weapons program, proving that the Tehran regime had lied about its efforts to acquire atomic weapons. Secretary of State Mike Pompeo said the intelligence trove was authentic and acknowledged that much of it was new to American experts. According to the BBC, Johnson's discussions are also expected to cover the crisis in Syria and also North Korea, ahead of Trump's meeting with North Korean leader Kim Jong Un, which now has a date and location arranged.